Responsible for unwanted and perhaps avoidable adverse impacts of disinfectants against the human health and the environment are their ingredients. To assess and avoid hazards caused by ingredients subsequently exclusion criteria and -scenarios mainly relying on their hazard statements are defined. 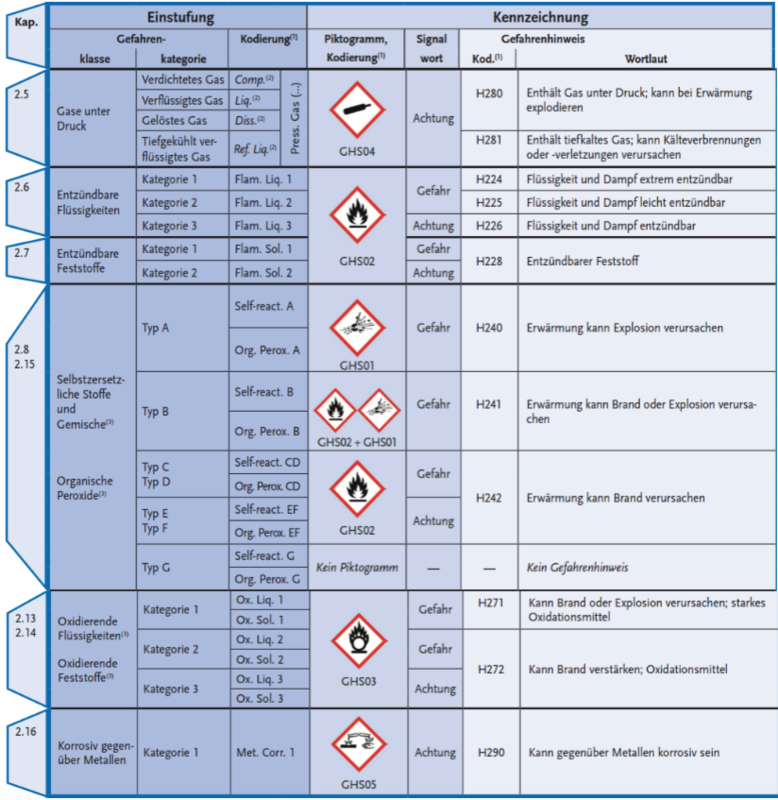 Since hazard statements are generated in the course of classification and labelling of substances, a short survey of the EU system of classification and labelling of substances is given. In 1992 the UN Conference on Environment and Development in Rio decided to standardise the hazard communication known as classification and labelling world-wide and call it Globally Harmonized System of Classification and Labelling of Chemicals (GHS). In 2002 at the World Summit on Sustainable Development at Johannesburg it was agreed to put this scheme into practice. The GHS differentiates between physical, health and environmental hazards. The type of hazard is described by hazard classes and a hazard class again consists of one or several hazard categories. Thereby the hazard category expresses the strength of the hazard. GHS provides 16 hazard classes for chemical and physical hazards, 10 hazard classes for health hazards and one class for environmental hazards. The classification and labelling according to GHS consequently relies on the intrinsic properties of chemicals. These properties are usually determined on the basis of globally accepted testing requirements (e.g. OECD guidelines). The EU has implemented GHS with Regulation 1272/2008 (CLP Regulation) which constitutes the legal standard for classification and labelling. The CLP Regulation demands that in the course of determining the hazard class andhazardcategoryalsotherespectivehazardstatementhastobeassigned. Figure1(inexcerpts)showsthe physical hazards, figure 2 the health hazards and figure 3 the environmental hazards. The figures comprise the hazard classes and -categories as well as the hazard statements both as code and in wording. Additionally the CLP Regulation overtakes from the previous legislation the concept of harmonized classification and labelling (CLH). A harmonized classification is determined for approximately 4000 substances in Annex VI (part 3) of the CLP Regulation. CLP demands that information concerning the classification and labelling of substances has to be submitted to European Chemicals Agency (ECHA). The obligation for notification concerns all substances placed on the market which are at least classified in one hazard class. The notifications form the basis for the publicly accessible Classification and Labelling Inventory (C&L Inventory). The C&L Inventory additionally shows all harmonized classifications and classifications for substances registered under REACH. 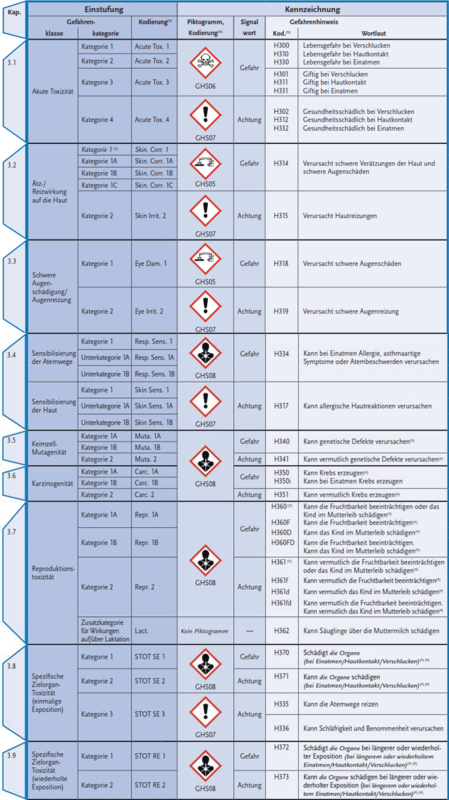 The tables provided by the German Federal Institute for Occupational health and safety (Baua) are only available in German. For the english wording the ECHA webpage (https://echa.europa.eu/) is recommended. The M factor applied for chronic toxic to the aquatic environment (Chronic 1) is derived from chronic aquatic toxicity and degradability. It is noteworthy that also substances which are readily degradable can be classified with “Chronic 1” if they show a NOEC value ≤ 0.01 mg/l. Which substance properties are avoidable when selecting disinfectants? To answer the question „Which substance properties are avoidable when choosing disinfectants?” an estimate is needed if such an option is realistic respectively which product alternatives remain after applying exclusion criteria or -scenarios. Such an estimate is needed because it would be meaningless to lay down product requirements which cannot be fulfilled by the market supply. With regard to the overall market supply a significant share of products should remain after the application of exclusion criteria. In the present case an exclusion scenario consists of a set of exclusion criteria. 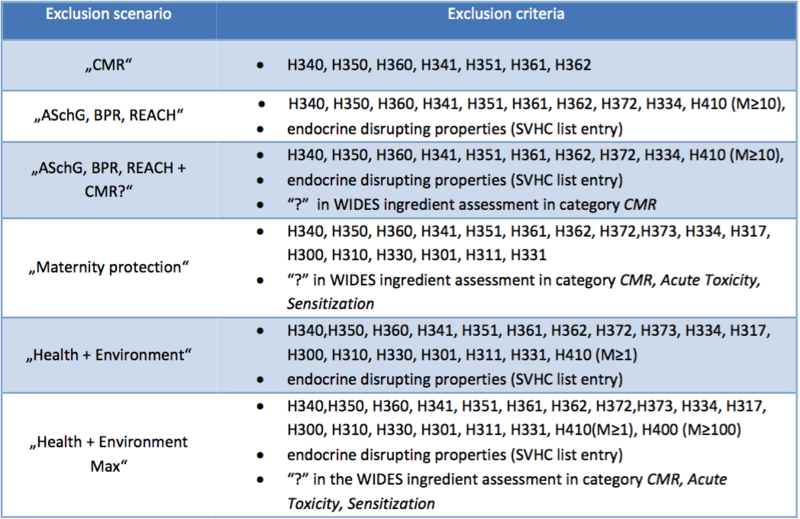 An exclusion criterion again is either a hazard statement, a data gap (indicated in the WIDES product assessment with a “?”) or an entry in the Candidate list for substances of very high concern (indicating endocrine disrupting properties). In 2015 the Bureau for Chemical Engineering TB-Klade analysed in a study if respectively to what extend the database for disinfectants WIDES can be used for the selection of disinfectants. In the study it was analysed which percentage share of the products listed in the WIDES pass a distinct exclusion scenario and which do not. In total six exclusion scenarios were defined either by deriving them from legal obligations or as an autonomous work. Bureau for Chemical Engineering TB-Klade: Exclusion criteria for the selection of disinfectants. 2015. unpublished. „CMR“: This scenario excludes substances with proven or suspected carcinogenic, mutagenic and repro-toxic properties. „ASchG, BPR, REACH“: This scenario substantially meets requirement of the Austrian ArbeitnehmerInnenschutzgesetz/ASchG (Workers Protection Act), the Biocidal Products Regulation (BPR) and the REACH Regulation and excludes substances with CMR properties, chronically toxic properties (Category 1), suspected endocrine disrupting properties and substances with an aquatic toxicity NOEC or EC10 < 0,01 mg/l for marine and freshwater organisms ≈ H410 with M≥10. Further excluded are substances classified as respiratory sensitizers with H334. „ASchG, BPR, REACH + CMR?“: This scenario expands the above mentioned scenario and additionally excludes substances with a data gap („?“) in the WIDES ingredient assessment in hazard category CMR. „Maternity protection“: This scenario covers the exclusion criteria from the decree in accordance with § 4 Österreichisches Mutterschutzgesetz (Austrian Maternity Protection Law) for hand disinfectants. „Health + Environment“: This scenario applies self-defined exclusion criteria for adverse effects on health and the environment. „Health + Environment Max“: This scenario applies self-defined exclusion criteria for adverse effects for health and the environment to a maximum extent. In total 126 products were included in the analysis which – at that time – represented 56% of all disinfectants listed in the WIDES. The testing procedure was to analyse all product recipes within a certain application. If at least one of the substances included in the product (i.e. at least one recipe component) meets an exclusion criterion the exclusion scenario was applied to the product. The scenario „CMR“ excludes 13 % to 38 % of all products and appears to be generally applicable. The scenario „ASchG, BPR, REACH“ excludes 56 % to 75 % of all products and appears to be applicable only for distinct applications. 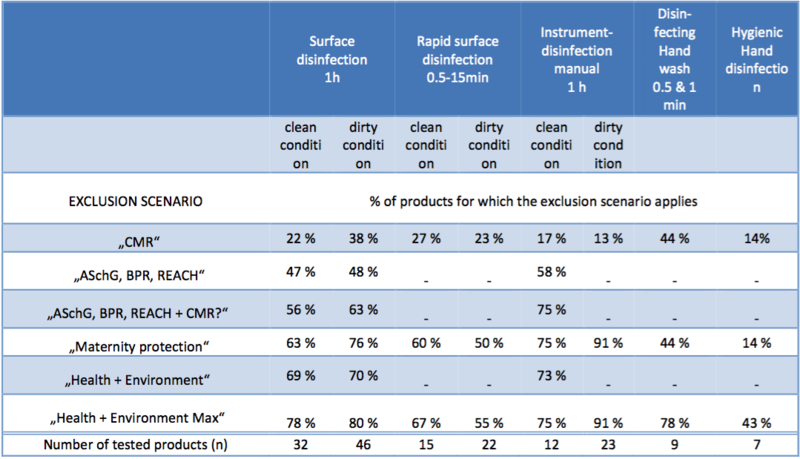 The scenario „Health + Environment“ excludes 43 % to 91 % of all products and appears not to be applicable for surface and instrument disinfection, however applicable for hand disinfection (hygienic) and (partly) rapid surface disinfection. The above cited exclusion scenarios in principle could be used for product tendering and product procurement. However it has to be taken into account that the calculated shares base on a (ingredient and product) sample from 2014 and may no more correspond to the current data sets. Beside not all disinfectants available on the (central) European Market were covered. The author therefore explicitly notes that it is not justified to establish a call for tender or a procurement practice on the above cited testing results. Instead the data and conclusions presented should demonstrate how the publicly accessible database for disinfectants WIDES may be applied to define executable exclusion criteria and -scenarios which subsequently can be integrated into procurement practices and tendering.